Saw this bit of news on MacRumors, ever since the WWDC keynote event where Mac OS X Lion, iOS 5 and others were announced by good old Steve Jobs, one of the new features of iOS 5 did manage to catch my eye. One of these new features within iOS is iMessage which is Apple’s own messaging service for it’s own devices. 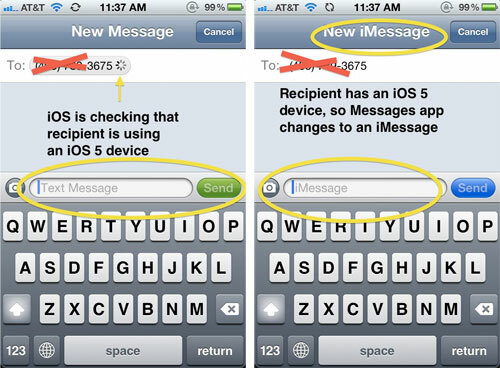 Built in to messages itself, what iOS 5 now will do is to check if the recipient of your message is using an iOS device and then sends it via iMessage instead of the usual SMS channel. I guess this is Apple’s official answer to RIM’s Blackberry messenger, WhatsApp and other messaging service. I do hope that there are other features such as group chats and all but as much as I like this to work, we all still have friends who don’t use iOS and rely on Blackberries and Android. What it does allow us to do is to save a bit of cash instead of sending SMS out, and I really do like it’s transparency feature where you only need to access messages instead of launching a separate app such as WhatsApp. Can’t wait for these new goodies to be available especially since I promised munz that I would get her an iPhone 5 and I definitely do need to upgrade my current MacbookPro. So far rumours have it is that the next model will sport a whole new casing design. Will probably wait for that. Also another feature which I am really looking forward to, is syncing iOS devices via Wi-fi. I decided to get the MacbookPro instead because I think I would need its power especially on the go for photography. Also gonna upgrade my desktop PC at home for Diablo 3 😛 Yeah finally fixed the issue with the permissions on the Theme files. up all of a sudden? Yeah would definitely want to wait for OS Lion next month. Yeah the MBA is a great machine, light and very handy because of it's battery life. Actually it was the permission settings for some of the style scripts. It was set on not executable by guests. Hence the wonky look. still tinkering around with my own blog.